High quality food safety audits delivered through the technical expertise and in-depth food sector knowledge of LRQA assessors. A streamlined auditing approach, ensuring your certification is cost-effective with minimal disruption and completed within critical timelines. 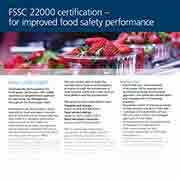 We are now fully accredited to deliver FSSC 22000 certification.